Q: What did you do during this break? HJ: Started using kakao talk with my friends. (host said she saw him using a lot in airport keke) When I rest, I started SNS life. Feel closer to friends using Kakao talk & Kakao story. Feelings can be expressed differently when using kakao compared to seeing friends face to face. Q: How are fans from different areas differ? Q: Many fans like IG. Any plans for more drama? HJ: No plans for drama at this moment. If there's good one, can start work anytime. HJ: No regret. Put in full effort all the time. The only thing is we spent too much time flying. For Peru, we thought it's summer then but actually winter. Staff brought slippers! Had to stay in hotel when not performing. Q: Any role you'd like for your next work? HJ: No specific role I like. For now, I want to act in roles of common people living daily life. Q: Can wear many costumes in such roles? Q: Any other areas you want to challenge? 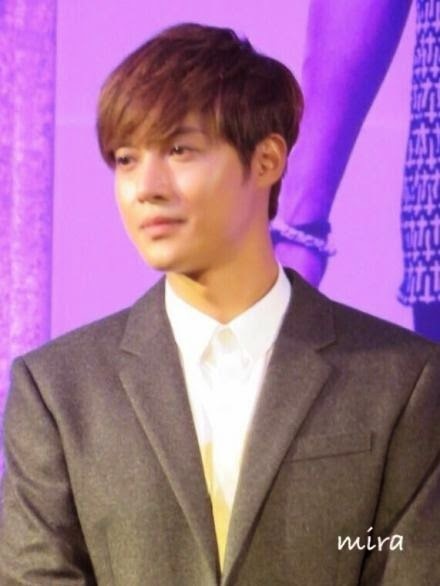 HJ: Singing and acting for now... if I come upon some other areas I am interested in, I will go for the challenge. HJ: I sing and act throughout the year. If I go for other challenges, it will be outside of my current work or even entertainment. However that may mean I need to abandon these. I do not want to do that... so concentrate on singing and acting now. Diving is just an interest. What I want to do is sing, act and my work. When I was in elementary & high school, I thought adults were old. But now I feel not just young people are young. We are all young. No matter 20, 26, or 29 years of age, I've had the same feeling... I feel no fear. Just another year. The HJ I'd envisioned when I was 20 yr old is not the same as the HJ now. Now I think about today and tomorrow. Live in the moment well. How should I say this? Please remember the HJ moments when I perform. The happy moments when you saw me perform on stage and on screen. When I live to be 40 years old or 50 years old I feel like as a 20-year-old energetic <-"